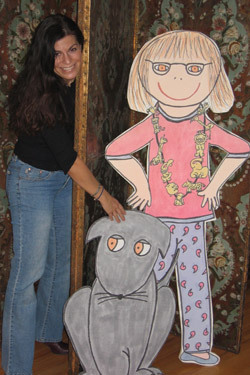 Miranda Hentoff is the creator of Mandy’s Menagerie. She has written, produced and recorded all the music for the property. She has also created, illustrated and designed its characters in a visual style distinct and endearing. Mandy's Menagerie is a natural extension of Miranda’s distinguished background as a songwriter, composer and music educator. Because of her charismatic teaching style and ability to reach and motivate children and adults, Miranda was chosen out of the Lincoln Center Institute’s three hundred teaching artists to help establish the Victoria Arts Center Institute in Melbourne, Australia. Her innovative teaching style also led to her work with special education classes in New York area public schools, where Miranda taught a program she developed that combined storytelling with music as an educational device. She also taught at the 92nd street Y Nursery School. 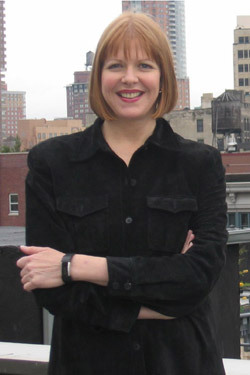 From 2002 to 2003, Miranda designed the music curriculum and taught for a pilot program at a model school on the campus of Hofstra University. Funded by the U.S. Department of Education’s Fund for the Improvement of Education Program, the goal was to improve the education of New York State teachers while providing a hands-on alternative model for middle school teaching and learning. Miranda was instrumental in designing a music curriculum aimed at deconstructing the artificial boundaries between academic subjects and the arts. Currently, Miranda is composing music for film and television. Her music has been featured on numerous episodes of the Emmy Award winning PBS documentary series Frontline, ABC News’ Primetime, as well as shows for Peter Jennings Productions and The Merrow Report, among others. Miranda’s film credits include the critically acclaimed Pennebaker/Hedgedus Production Start-Up.com and most recently Golden Venture, a Peter Cohn film narrated by Tim Robbins which premiered at the 2006 Tribeca Film Festival in New York City. She has also composed a number of commercials for Howling Trout Productions. Miranda earned both her Bachelor’s and Master’s Degrees from the Manhattan School of Music in New York City. Jenny Baldwin has had an extensive career in the entertainment industry as a creative and innovative television executive. She is a business leader who can effectively translate between creative and business people to create highly profitable new products, licensing partnerships and promotional programs. Jenny has co-developed the Mandy’s Menagerie story and its characters and is responsible for business development, licensing, marketing and product development. She is currently forming distribution partnerships for the Mandy’s Menagerie CD, apparel, plush toys, animation and publishing. In 1990, Jenny joined Nickelodeon/Nick at Nite as Director of Licensing/Consumer Products. She was a member of the launch team that built Nickelodeon Consumer Products into a profitable $20M business in less than three years. Jenny managed the Nickelodeon Activity Toys line with Mattel, which became an international brand. She also launched the initial consumer products for Nicktoons: Ren & Stimpy, Rugrats and Doug. Prior to Nickelodeon, Jenny worked at Capital Cities/ABC, Inc. for eleven years in a variety of roles as both a marketing and program executive for ABC Entertainment and ABC Video Enterprises. Jenny was in charge of licensing all ABC owned trademarks (ABC Sports, ABC Daytime, ABC Primetime, ABC Children’s) and developed and implemented a range of sponsored promotions, direct and retail marketing and licensed products. As a Program Executive for All My Children, Jenny was involved in ongoing story meetings, casting decisions, public relations, special events and Emmy Awards. Early in her career, Jenny conducted interviews and tested children for an ABC funded study at Yale University conducted by Dorothy and Jerome Singer. The study explored the effects of television on intelligence, creativity and socialization of children ages pre-school through 6th grade. Jenny has also been an audiologist, teacher of mentally retarded adolescents, and a coach for the Special Olympics. Jenny has also been a performer. She played a Tree in As You Like It at the Yale Rep, directed by Ulu Grosbard, and performed as a jazz singer for three years at The Bubble Lounge in New York City, among other venues. Jenny arranged and sang the vocal harmonies for the Mandy’s Menagerie CD. Jenny received her M.A. in Audiology from Louisiana State University and her B.A.E. in Theatre from the University of Mississippi.